The topic of director Ava Duverney’s “13th” is that this country’s prison system is set up to incarcerate as many people as possible so companies, private individuals and politicians benefit financially by way of the businesses that provide goods and services to prisons. The focus is on how blacks are targeted for minor offenses (pot possession) and arrested and imprisoned. Because they’re too poor to make bail or hire lawyers, the amendment doesn’t apply to them. Prisoners are, among other things, used as laborers to make goods sold at retail outlets like Sears and Penneys. 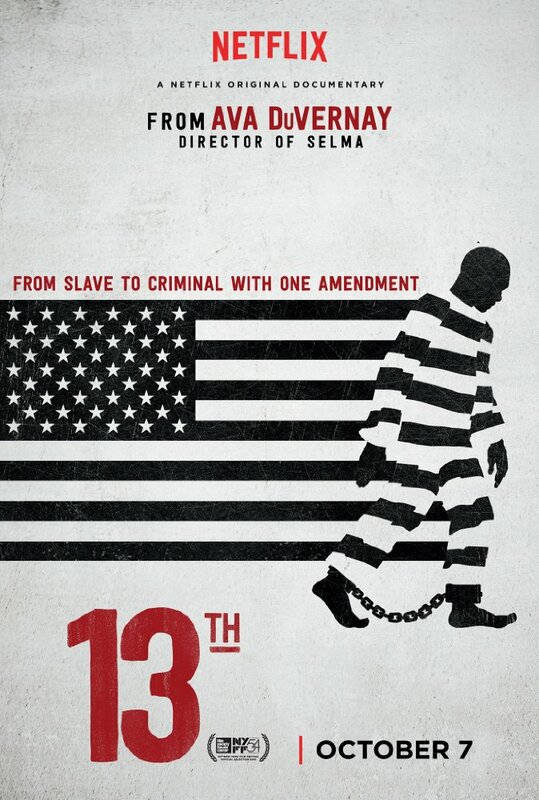 “13th” goes into detail about the American Legislative Exchange Council (ALEC, which includes State Farm Insurance, Walmart, P&G, Google, J&J, Koch, PhRMA) and the Corrections Corporation of America, organizations that directly benefit by incarcerating as many people as possible. In justifying making money off the prison system and prisoners, Maryland State Senator (R) Michael Hough, a member of ALEC, says (in a self-congratulatory way that doesn’t come across in print), “We’re supposed to be the party of innovation.” And delusion. He also admits to not understanding what the critics of ALEC are even talking about. What you notice most prominently about his presence is the vacuous look in his eyes as he speaks. And that he’s in terrible physical shape for someone even 20 years older than he is. What’s bolded is the loophole that allows the system to use and abuse prisoners as they wish. In other words, treat them as slaves. Then, of course, there is the associated violence against blacks, which is dehumanizing and terrible, however familiar we are with the images. When you commit a crime, you become a legal enemy of law enforcement, where institutional racism is not uncommon. When you resist arrest, you set yourself up to be killed by someone with a gun, the law and a very corrupt and racist system on their side. People can choose to not commit a crime and not resist arrest. As we know, many people become cops just for those moments, especially the racist cops. PEOPLE, PLEASE STOP COMMITTING CRIMES AND PUTTING YOURSELVES IN A POSITION WHERE YOU CANNOT WIN2. The worst and most tragic examples of people killed or imprisoned are those who are completely innocent. What’s most revealing and disappointing about what we learn from “13th” is how much in the dark the American public is and will always be concerning the political and corporate machines in this country and the sick relationship they have with each other, all at the expense of the rest of us and how little our lives mean to them. In a timely segment that all but guarantees a Best Documentary Oscar win, video and audio excerpts from Donald Trump’s low-road-to-the-White House campaign are used brilliantly against the backdrop of Jim Crow and Civil Rights photos and film footage of brutal violence against blacks. Powerful. 2 Now I’m really starting to think the federal government refuses to legalize pot for the reasons presented in this film. DECRIMINALIZE POT AND YOU REMOVE THE CRIMINAL ELEMENT. The same with cocaine. Like with alcohol, it has to be emphasized that MODERATION is the key when using any of these substances, although abstaining from all of them — unless you have a health condition that marijuana would help with — is the best choice. Actually, I’m borderline on the cocaine issue but you know what I mean. Decriminalize it and you get rid of mind-boggling stories like this one involving a retired NYPD cop. http://www.nydailynews.com/new-york/nyc-crime/crooked-retired-charged-killing-cocaine-deal-article-1.2917469 That’s much more my point than the drug use itself, which I don’t condone at all. I don’t even drink coffee. Free up the law enforcement and legal systems, save billions on the losing war on drugs, and rake in even more billions in tax dollars, for crying out loud. Look at how dumb and ineffective prohibition seems to us in hindsight. For all her prudishness, Carrie Nation’s heart was in the right place but look at the crime (and Joe Kennedy’s ascension) brought on by prohibition. I don’t feel the same about opioids or unnecessary (I know, it’s a hard call) prescription drugs, especially the ones for anxiety and depression. There have to be better alternatives to those mind-mangling chemicals, which are severely over-prescribed by doctors in this country. According to this 2016 SI interview with former NFL running back and 1998 Heisman Trophy winner Ricky Williams, 60-70% of NFL players smoke pot; not just for recreational purposes, but to help with anxiety, depression and pain from injuries. http://www.si.com/nfl/2016/07/13/ricky-williams-nfl-players-percentage-smoke-marijuana In Williams’ case, his advocacy for the legalization of marijuana detracted from his NFL career — including a one-year suspension — but he was an extremely talented and hard-working guy nonetheless. I’m watching an open discussion on CNN between Trump supporters and people who oppose him, maybe about ten people in total. The anti-Trump people are articulate, thoughtful, open-minded, racially mixed, in good health and all seem educated. The Trump supporters are inarticulate, unbending, severely overweight and white. The Trump supporters think the news is misleading the public to believe that most people are anti-Trump because everyone in their incredibly limited (despite access to TV and the internet) and narrow-minded world thinks like they do. Their tense body language and facial expressions show they’re clearly uncomfortable and upset being around intelligent, articulate people, especially women of color or who are gay. When one of the Trump supporters says he has friends from all walks of life, you get the impression he’s talking about his white mechanic, his white postal carrier, his white fellow NRA members, his white neighbors, his white boss, his children’s white teachers, the other white PTA members, his white fellow truck drivers, his white fellow NASCAR devotees, his wife’s white friends who watch Honey Boo Boo and Real Housewives of ______ , his white fellow Elks Club and Rotary Club members, . . .you know, all walks of life.